Physics Buzz: Capricorn Investments LLC ? This economic downturn is making people do some pretty crazy things. All across the world, retail sales are slumping, banks are failing and people are losing their houses. However one slim section of the economy that is actually booming amidst this whole mess are the astrologers and psychics of the world. This does not bode well. No joke; while the economy is falling apart all around us, people are looking the motions of planets and stars for financial advice. A recent CNN story reported that astrologists and psychics have been seeing more business, mostly from people seeking financial advice. Statistics following psychic business are a bit hard to come by, it seems no one bothers to track the industry to carefully. However numerous professional psychics have reported giving out a lot more advice on mergers and acquisitions. It's not just in the United States either. In Austria an entire insurance company wants to only hire managers and salesmen born under certain astrological signs. In China, which operates on a different astrological calendar, psychics have predicted that 2009, the year of the Ox, will be one of economic hardship and turmoil. I don't think anyone needs anything more mystical than the Wall Street Journal to figure that out. Is anyone else as worried about this as me? What got us into this mess in the first place were people making bad and unfounded business investments. 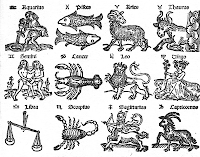 The last thing the world needs right now are horoscopes guiding the markets. Though it's been around for as long as people have looked up at the night sky, astrology is totally and completely bunk. Just adding the suffix "-ology" to the end of a word does not make it a science. Simply put astronomy is the science of stars and planets based on measurable facts while astrology is nothing more than a collection of superstitions. Other than how the rotation of the Earth makes day and night and Earth's tilted axis creates seasons, celestial bodies have no impact on business ventures and romances. Reading your daily horoscope next to the comics section in the morning paper can be a pleasant diversion. Deciding the fate of your business based on stars and planets could easily ruin your company. Remember also, just like everyone else, these psychics are often just out to make money too. Astrologers have always amused me with the way they pick and choose bits of astronomy to suit their field. There are actually 13 constellations that lie on the ecliptic... but for some reason Ophiuchus was left out of the zodiac signs. Poor guy. Now that Pluto's no longer a planet, how is that going to throw off thier measurements I wonder.